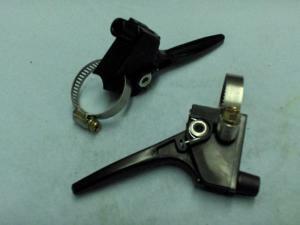 One Small Black plastic Molded Lever throttle Control with return spring and slot for Mounting strap. Comes with the #16 mini hose clamp with the 5/16" wide band as shown. Zenoah, Robin, Tanaka & Mitsubishi Throttle cable ONLY 60" Custom Made 1.5"